When installing air-conditioning, it is necessary to pull out air in the piping pipe. Otherwise, moisture air and in air remains in the refrigerative, and it influences the movement of the air conditioner. It influences the longevity of the air conditioner because of use for a long time. It is a method of driving out in piping and air and moisture in the indoor unit when the separates type air conditioner is installed. The air purging is to drive out air in piping. To prevent the envirommental destruction, this method is recommended. When the piping of the air conditioner ends, the low-pressure side hose of the manifold is connected with the service port, and the valve is opened. The hose with a yellow center of the manifold is connected with the vacuum pump. The vacuum pump adaptor is installed in the vacuum pump excluding the vacuum pump of the vacuum pump adaptor all-in-one design. In piping and air and moisture in the indoor unit are pulled out by driving the vacuum pump for about 15-20 minutes. -0.1MPa is confirmed with the pressure gauge. Only it is to pull out air and moisture, it is not necessary to make it to the high vacuum especially. The vacuum pump is removed and the valve of the air conditioner is opened when ending. It is a method to drive out air in piping with an outside gas cylinder gas. This method had been used well in old times. The gas cylinder is connected with the service port (It is a three-way valve and a pipe side of usually fat one), the flare nut of the pipe (It is a two-way valve and usually thin one) on the other side is loosened while injecting the gas, and air is driven out. When installing it, you may not tighten and loosen the flare nut of this pipe beforehand when putting it without tightening. It causes the gas leakage when doing many times. Allen wrench is inserted in the valve in not attached (It is a two-way valve and a thin piping side) the service port after it installs air-conditioning, the valve is opened 90 times, and it closes a valve at about six seconds. All air is discharged pushing rubber of the service port (piping side where the three-way valve is fat) by Allen wrench etc. Afterwards, both valves are opened. It was a method that the manufacturer recommended before. I do not think that there is a wonderful difference though it is likely to differ from the manufacturer this method and a little according to the model. 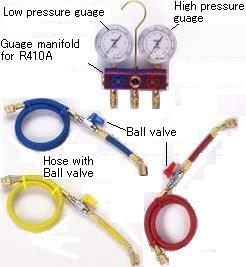 The gauge manifold valve uses the thing only for the refrigerative. The caliber at connected entrance is different because of the refrigerative. The vacuum pump can use the manual one when limiting it to the air purging though is also the electric one. A high vacuum level is too unnecessary. The vacuum pump adaptor prevents the oil of the vacuum pump from flowing backward to the air conditioner side through the charge hose. Please install it. The increase tightening of the cap of the service port and the cap of the valve is done for remembrance' sake. The gas leaks for a long time when this is forgotten.